Tesco's line of instant noodles are color coded so that you can grab the flavour you crave at a glance. The packaging is fairly plain but has the cute quirk that the second "o" in "Noodles" is shaped like a mouth slurping a noodle. It's small touches like this that sway my decision when I am picking out a pack of noodles. 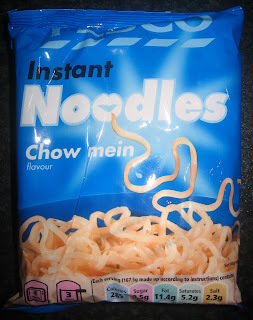 Unlike most noodles reviewed on this site, the Tesco instant noodles are meant to be eaten dry. 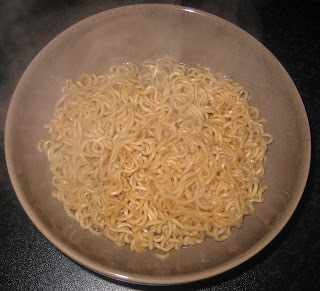 The typical method of cooking involves adding a relatively small amount of water (~300mL) to a saucepan and cooking the noodles until all the water is gone. I believe the dry noodle style reflects the British and Irish palate where noodle soups would be very rare at Chinese restaurants. It's a shame since noodle soups would be the perfect thing to warm up in the cold weather of the British Isles. The Tesco instant noodles are undoubtedly high quality. They maintain their springiness yet are soft in the mouth. The chow mein flavouring and nicely subtle and contains hints of soy sauce, garlic, ginger, and onion. It is fairly unassuming but also unmistakably Asian in flavour. Overall, this is a pack of noodles that I am happy to slurp whenever I am looking for a basic pack of noodles that is not too flavourful. Sounds good, I like to try some. I've just bought some of these along with the chicken ones. I ate the chicken ones first but due to sudden attack of laziness I used the microwave instructions. Not so good i'm afraid. Too dry and the texture is substandard and the taste disappears. Conclusion: don't be lazy- put them in a pan. Keep it up, hope all is well with everyone on the site.